Last night was another successful Twin Cities Women In Digital event. Our most successful, in fact. We are one of the newest chapters in the nation, but last night 87 women attended our event at Industrious North Loop, and more than 10 women signed up to join the organization, making this our biggest turnout yet. It was a night filled with honesty, vulnerability, advice, and badassery. I had a lot of fun. We heard from Margaret Murphy, Founder and CEO of Bold Orange, and Laura King, Senior Talent Acquisition Consultant at Thomson Reuters, about how to negotiate salary, initiate difficult conversations, and—most importantly—stand up for yourself. Be your badass self and demand what you deserve. That's a message I can get behind. "The first person you have to influence and convince that you’re worth it is yourself." "Communicate your wins EARLY and OFTEN." "If what you’re saying is impactful, I don’t notice how you’re sitting." "You’re gonna learn more when it’s tough—guaranteed." "Try not to stress out about things as much as you probably are." What first encouraged me to join Women In Digital were the board members (who are now some of my best friends). After attending the first event, I received a personalized email from Caitlin, welcoming me and letting me know I could reach out with questions. That simple act made a world of a difference. At the next event, everyone greeted me by name, asked me about work, and voiced their excitement that I'd come back to attend a second event. It felt like people actually cared, and I wasn't just another number. It's this sense of community that I've heard other members express gratitude toward as well. 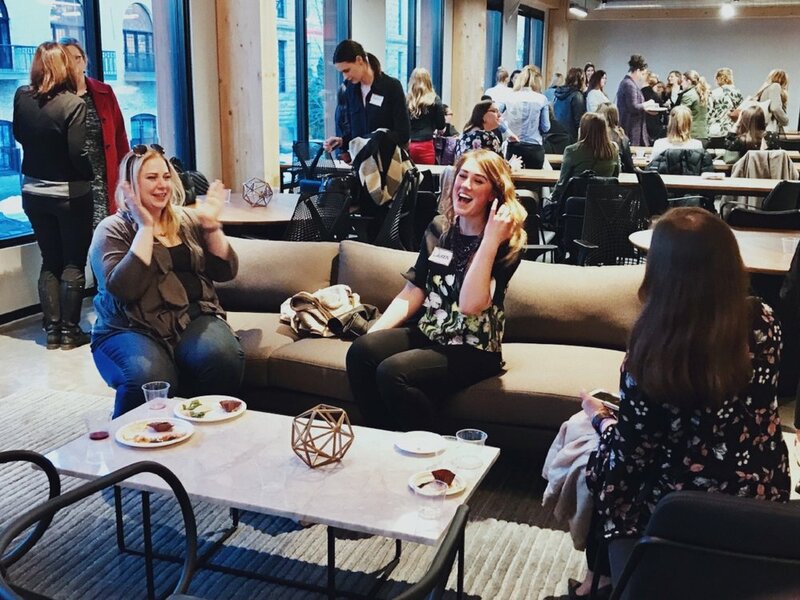 In a short amount of time, we in the Twin Cities chapter have created a space where women can let go of the stress of the workday, pop open a bottle of champagne, kick back in a safe space and soak in a bit of wisdom, and—perhaps most importantly—get to know their peers. Someone once told me, "Never burn a bridge in Minneapolis. It's a small city; if you stay in the same industry, you're bound to run into—about probably work with—that person again." I love that Women In Digital provides a space for me to get to know others, so I can continue expanding my network and fostering this community. That's it for this recap! Thanks for tuning in! If you're interested in joining Twin Cities Women In Digital, join our Facebook group! We host events like these every month.